M. S. Subbulakshmi wearing saree of a colour which has become synonymous to her name – MS Blue. Madurai Shanmukhavadivu Subbulakshmi (16 September 1916 – 11 December 2004) was an Indian Carnatic singer from Madurai, Tamil Nadu. She was the first musician ever to be awarded the Bharat Ratna, India's highest civilian honour. She is the first Indian musician to receive the Ramon Magsaysay award, often considered Asia's Nobel Prize, in 1974 with the citation reading "Exacting purists acknowledge Srimati M. S. Subbulakshmi as the leading exponent of classical and semi-classical songs in the carnatic tradition of South India." Subbulakshmi (Kunjamma to her family) was born on 16 September 1916 in Madurai, Madras Presidency, India to veena player Shanmukavadiver Ammal and Subramania Iyer. Her grandmother Akkammal was a violinist. She started learning Carnatic music at an early age and trained in Carnatic music under the tutelage of Semmangudi Srinivasa Iyer and subsequently in Hindustani music under Pandit Narayanrao Vyas. Her mother, from the devadasi community, was a music exponent and a regular stage performer, and Subbulakshmi grew up in an environment very conducive to musical learning. Her musical interests were also shaped by regular interactions with Karaikudi Sambasiva Iyer, Mazhavarayanendal Subbarama Bhagavathar and Ariyakudi Ramanuja Iyengar. Subbulakshmi gave her first public performance, at the age of eleven, in the year 1927, in the 100 pillar hall inside the Rockfort Temple, Tiruchirappalli; with Mysore Chowdiah on the violin and Dakshinamurthy Pillai on the mridangam. This was organised by the Tiruchirappalli-based Indian National Congress leader F. G. Natesa Iyer. In 1936 Subbulakshmi moved to Madras (now Chennai). She also made her film debut in Sevasadan in 1938. Her debut to the world of cinema was again opposite F. G. Natesa Iyer. M.S. Subbulakshmi began her Carnatic classical music training under her mother Shanmugavadivu; and later in Hindustani classical training under Pandit Narayan Rao Vyas. Subbulakshmi first recording was released when she was 10 years old. By the age of seventeen, Subbulakshmi was giving concerts on her own, including major performances at the Madras Music Academy. were significant landmarks in her career. In 1969 she was accompanied by Indian Railways Advisor SN Venkata Rao to Rameshwaram, where she sang several songs in front of each idol in the Rameshwaram temple. She shared a very cordial relation with Sree Ramaseva Mandali Bengaluru for whom she performed 36 concerts. Sevasadanam is one of the early Tamil films to be set in a contemporary social setting and to advocate reformist social policies. The film is an adapted version of Premchand's novel Bazaar-e-Husn. The veteran Marxist leader N. Sankaraiah, has described Sevasadanam as an "unusual film" for choosing the subject of marriages between young girls and old men (which had social sanction). According to him, the film successfully broughtout the "sufferings of the girl" (acted by M.S.) and the "mental agony of the aged husband". (acted by F.G.Natesa Iyer).Tamil film critic and historian Aranthai Narayanan observes in his bookThamizh Cinemavin Kathai (The Story of Tamil Cinema) that "Seva Sadhanam proved a turning point in the history of Tamil cinema. In the climax, the aged husband, now a totally changed man, was shown as casting aside with utter contempt his 'sacred thread', which symbolises his Brahmin superiority. It came as a stunning blow to the then Brahmin orthodoxy." 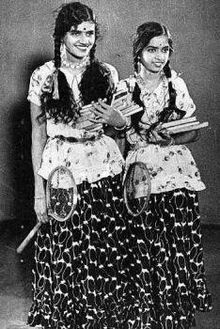 MS Subbulakshmi also played the male role of Narada in Savitri (1941) to raise money for launching Kalki, her husband's nationalist Tamil weekly. 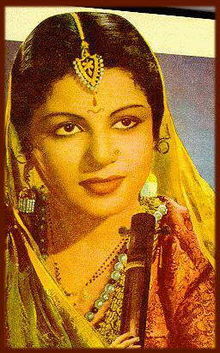 Her title role of the Rajasthani saint-poetess Meera in the eponymous 1945 film gave her national prominence. This movie was re-made in Hindi in 1947. ^ "M S Subbulakshmi: 'Nightingale' of Carnatic music". Rediff. India. 12 December 2004. Archived from the original on 8 July 2015. ^ Clare Arthurs (25 July 2000). "Activists share 'Asian Nobel Prize'". BBC News. Retrieved 20 February 2008. ^ "Ramon Magsaysay Award Foundation". Rmaf.org.ph. Retrieved 22 September 2013. ^ Srivastava, Gauri (2006). Women role models: some eminent women of contemporary India. Concept Publishing Company. pp. 55–57. ISBN 978-81-8069-336-6. OCLC 74991412. ^ a b "M.S. subbulakshmi passes away, aged 88". The Hindu. 12 December 2004. Retrieved 19 October 2009. ^ "M. S. Subbulakshmi (1916–2004)" (PDF). National Resource Center for Women, Government of India. Retrieved 19 October 2009. ^ "Popular Indian classical singer M.S. Subbulakshmi dead". Pakistan Times. 13 December 2004. Archived from the original on 11 June 2008. Retrieved 16 October 2009. ^ Murthi, R. K. Encyclopedia of Bharat Ratnas. Pitambar Publishing. pp. 176–179. ISBN 978-81-209-1307-3. ^ K.S. Mahadevan. "M.S.SUBBULAKSHMI – A DIVINE MAESTRO". Press Information Bureau, Government of India. Retrieved 6 January 2012. ^ "The stamp of honour". The Hindu. Hinduonnet.com. 10 July 2000. Retrieved 22 September 2013. ^ Arandhai Narayanan (2008). Arambakala Tamil Cinema (1931–41) (in Tamil). Chennai: Vijaya Publications. p. 26. ^ "Vishwanathan S. "A progressive film maker; Tribute to K.Subramanian, Volume 21 – Issue 14, Jul. 03 – 16, 2004 of Frontline magazine ,(brought out by Hindu publications), Chennai, Tamilnadu". Frontlineonnet.com. Retrieved 22 September 2013. ^ "MS Subbulakshmi's music is relevant even today". IBN Live. India. 16 September 2011. ^ "Humility personified". The Hindu. India. 17 December 2004. ^ "Statue of M.S. unveiled at Tirupati". The Hindu. Tirupati, India. 29 May 2006. ^ "The lure of the Kanchi silk". The Hindu. India. 5 November 2004. ^ "Stamps – 2005". Department of Posts, Indian government. Archived from the original on 30 July 2013. Retrieved 2 August 2013. ^ "U.N. to issue stamp to mark M.S. 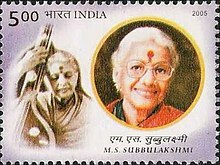 Subbulakshmi's birth centenary". The Hindu. 12 August 2016. Retrieved 13 November 2016. ^ "Pages ago – Singing for Bapu, Jawaharlal and Paramacharya". The Hindu. India. 22 December 2010. Wikimedia Commons has media related to M. S. Subbulakshmi. "Artists: M.S.Subbulakshmi, Nat Geo Music". National Geographic Society. Archived from the original on 14 November 2006.